Valentine's Day Promos, Sneak A Peek: Planet Exotica, Rhyming Reels: Queen of Hearts, Ruby of the Nile Slots And Multi-Wheel Roulette At Jackpot Factory. On February 7th, All Slots, All Jackpots and Wild Jack online casinos have launched three new slots and an exciting new multi-wheel roulette table game. Feel the passion with the exciting games and get extra cash! This month's slot games evoke Valentine's Day passion and excitement with Sneak a Peek: Planet Exotica, Rhyming Reels: Queen of Hearts and Ruby of the Nile. Earn double loyalty points on these new slots! Meet the galaxy's hottest babes on a 15-line slot game full of bonus features – wild symbols, free spins, multipliers and more! Reveal wilds & scatters and win big! The Sneak a Peek bonus game challenges you to match three of the same item to get up to 12,000 coins with a winning multiplier. Plus, earn up to 1,000,000 coins in the hot “Select a Smooch” bonus feature! 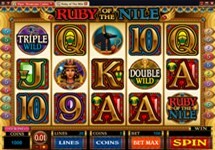 Glittering rubies, free spins and generous multipliers abound in this 20-line ancient Egyptian slot game! Discover Ancient Egypt's glittering rubies, free spins and generous multipliers in this new slot machine, with 2 wild symbols and 4 scatter symbols! When the treasure chest symbol appears in the middle of reel 5, you'll win up to 20 retriggerable free spins. Just in time for Valentine's Day, this 30-reel slot offers big wins with doubled payouts, free spins and stacked wilds. Top payout: 2,400,000 coins with free spins! 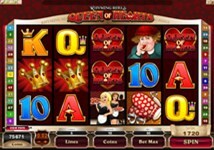 “The Queen of Hearts, she made some tarts on all a summer's day.” Stacked wild symbols make this 30-line slot a real treat! 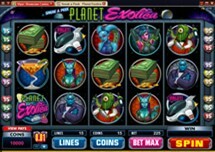 Play up to 8 roulette wheels at once on this brand-new game! 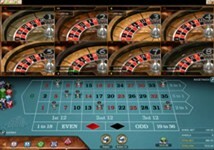 Now you have the opportunity to bet on eight roulette wheels at once! This Gold Series game brings the sophistication you demand, with the additional option to place Call Bets on the table! 25 Free Spins Every Week On The Hottest Slots! Week 1: Tomb Raider – Secret of the Sword (TM). Week 4: Wheel of Wealth Special Edition. We think you should know why it pays to play at All Slots Casino. The award-winning online casino have published high payout percentage rates, which gives players a better value, with more fun for their money. Highest average payouts mean highest chances of winning for players. Claim 100% match signup bonus, up to 200 credits, with your first deposit! Plus, players are given 10% cash back on every purchase, up to 450 bonus credits per month! Together, this means you receive over 5,000 bonus credits a year from All Slots Casino!